Need more information about booking Home 123924 ? The Farthings are a modern purpose built block of apartments. Each apartment is individually furnished to a high standard. 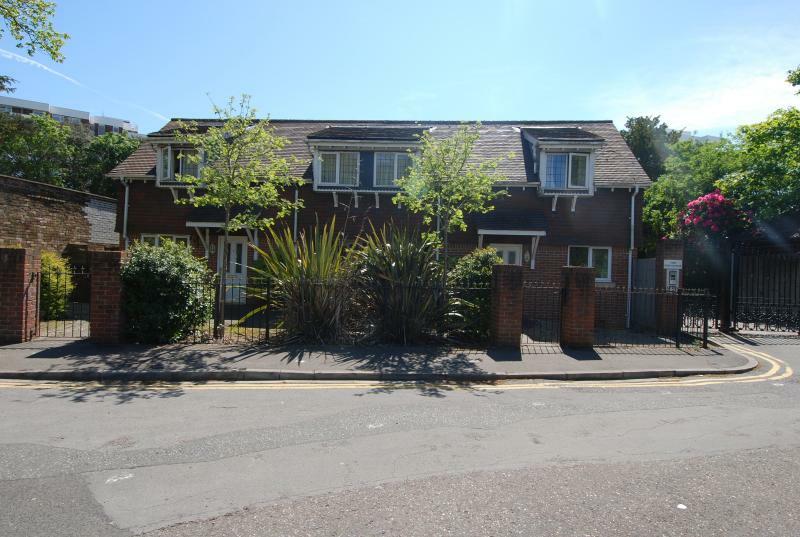 The holiday atmosphere starts as the electric gates open and let you into the development.A charming small block of four apartments in the very heart of Bournemouth, just a short walk to the beach or shops. The Farthings are charming and each of the apartments has their own charm and character, they are fitted out to a high standard with quality fittings and furnishings. You can almost fall out of bed onto the beach.Just perfect for a quiet and peaceful break or longer stay with the family or adults sharing, No groups please.If you have children you should be aware that the stairs exit from the central hallway to the ground floor entrance hall; however we have a stair gate. Upper Farthings is on the first floor and has its own front door, entrance hall and stairs to its landing/hallway. The master bedroom has two single beds that can be put together and en suite bathroom. The second bedroom has a double bed, there is a separate shower off the Hall. Four will sleep in great comfort. We have one car (not bigger) parking space for each apartment.Bournemouth and Dorset are amazing, the coast is stunning with mile after mile of sandy beaches, bays and clear water. Further West is the Jurassic coast with caves, rocky cliffs and amazing coastal walks. Inland the countryside is varied with hills and pasture sprinkled with little villages and enticing market towns.Bournemouth itself offers something for everyone, coffee shops, international dining and a delight around every corner. This is an amazing place to stay, enjoy and take away in your heart. This apartment is ideal for a couple or two as well as families. Those with young children should be aware of the stairs and a stair gate can be provided. We do not take groups. We offer a quiet setting for those who like a little peace and tranquility. This Apartment has 2 bedrooms, 2 bathrooms and sleeps 4. It’s been listed on Holiday Lettings since 29 Mar 2010. Located in Dorset, it has 69 reviews with an overall rating of 5. The average weekly rate varies from £400 to £480. We had a wonderful time in Bournemouth. Totally, due to the excellent apartment, and loved the fact that we had our own entrance. The apartment was clean and tidy and location brilliant, with the bus stop almost on the doorstep, which was ideal for my Mum, and even better that she could use her bus pass. Walking distance to the beach and town, but with buses almost every five minutes - why bother! The owner was very helpful with insructions for the property and places to visit and eat. A bonus with parking space too. A definite recommendation to friends. Owner's reply: Thank you for your review and helpful information within. We are blessed with a great location and many guests find the local buses very useful too. We hope to host you again soon. We had a great time at the Farthings. Location excellent, the apartment clean and spacious. Owner helpful. Owner's reply: Thank you for taking the time to write your review. Always good to read and more important; very useful for those that don't know us yet. Had a great time. Flat was clean and very comfortable. Being centrally located it was close to all amenities without having to use our car. Loads of things to do with the kids and great places to eat. Would definitely recommend. Thanks for a lovely stay. Owner's reply: Thank you for the great review and being fantastic guests, the apartment was spotless when we went in to do the turnaround. Also good to hear how you enjoyed Bournemouth with the family. Its a great place this town, amazing beaches, walks, restaurants and all weather entertainment. We were impressed by this clean apartment situated close to the city centre and beach. The apartment was well furnished and equipped with appliances making our stay very comfortable. Stephen and Lya were considerate in accommodating our requests and provided a homely and welcoming stay. Owner's reply: It was lovely to have your family to stay and we are delighted you enjoyed our apartment. Bournemouth has so much to offer all year round and we look forward to your next visit. Thank you for taking the time to write your review. This was our second stay at the Farthings and once again it was perfect. Stephen and Lya were so accommodating with our requests and helped ensure that we had everything we could possibly need during our stay. The apartment was very clean and well equipped with everything you can think of, a real home from home. The apartments is ideally situated a 5 minute walk from the beautiful gardens and seafront, but not too close to hear all the hustle and bustle of the city at night. This is our first choice for accommodation when visiting family in Bournemouth and we cannot wait to return again soon. Owner's reply: Thank you for taking the time to write your review and it was a pleasure to see you all again. We are delighted you continue to enjoy our Farthings experience as we always do our best for our guests. Have a wonderful new year and we look forward to your next visit. Owner's reply: Lovely to meet you all and thank you for the review. We look forward to hosting you again soon and don't forget to ask for your return visit discount when booking again. With the number of repeat visits we are getting we will be able to keep this place a secret one day! My friend and I have just spent a very happy week staying in Upper Farthings 3. It is a lovely flat, very well eqipped, attractively decorated and beautifully clean. We loved the reasonably short walk to the pier and made good use of the many buses that can be caught from the conveniently placed bus stop. The only downside for us both was the rather invasive noise of traffic whirling round the roundabout during the night. This noise is only noticeable at the front of the property which is, unfortunately, where the bedrooms are. Owner's reply: Thank you for your lovely review and the time you took to write. We are blessed with an amazing location so close to everything including the sea, town and transport and accept we therefore experience a little of the hustle and bustle of modern life. We listen to all our clients comments and continue to adapt to changing demands. We hope to see you again soon. The flat was very clean and had all furniture and appliances needed. There was hand wash, shower gel and washing up equipment, as well as linen and towels. Plenty of wardrobe and drawer space. The other 3 flats were all occupied during our stay but we experienced no noise from them. The flat has designated parking behind security gates. Bit of a squeeze, but welcome as parking around the area is limited. The locality of the flat meant we actually didn't use the car much because we could walk to places (5 min walk to the East Cliff lift, straight down to the beach). Easy to use central heating. Wifi access. We would definitely return. Owner's reply: We appreciate all our reviews, so thank you for taking the time to write one. We are always fine tuning our client experience as times change and expectations alter. The one and for many clients the most important aspect of The Farthings is location; and we are blessed with a unique setting so close to everything yet tucked in our own little spot. this is the second time we have stayed here, and the apartment is spacious, clean and within walking distance of town centre. Also has private gated parking for one car. All facilities are excellent and rooms of good size. Will definately consider going back again. Owner's reply: Lovely and thank you for your comments. We look forward to seeing you again. Great location, near all amenities. Car parking was very handy. Rooms were lovely and clean, and having 'the little things' like dishwasher tablets, salt and pepper etc meant that we didnt't have to buy all that stuff from the supermarket. All in all a great stay. Owner's reply: Many thanks for your review and we are delighted you have enjoyed our apartments. The reviews do keep us on our toes and we like to feel we offer a great experience with what we put in. The location is of course just perfect and that is sounded out again and again by our clients.